Distinctive, dark green Italian-type zucchini with light green ridges. Appears star-shaped when slices are cut crosswise. Sweet taste and crisp texture. Upright, vigorous plants with open habit. Ready to harvest 55 days after sowing seed in the garden. Grows best in full sun and average soil. Squash, Gadzukes! Zucchini Hybrid is rated 4.4 out of 5 by 16. Rated 5 out of 5 by Mr B from Best zucchini I've grown this zucchini for years and will keep growing it next year. We use it in salads ,sautéed,baked and zucchini bread. It doesn't get watery like others even when gets large. Rated 5 out of 5 by Laurelle from I have planted gadzukes for many years and love it I ended up with 3 plants started inside. One didn't come up. Now that they are bearing, one isn't a gadzukes. It is striped but no ridges stick out. It is just smooth. It tastes good, but I love the ridges for slicing etc. Rated 5 out of 5 by 171wbryan from Flavorful! We have tried other zucchini but always insist on growing Gadzukes! as well. 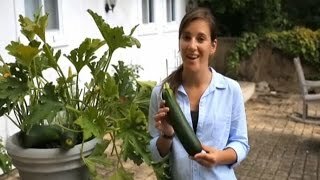 While not as productive as other zucchini (a plus? ), Gadzukes! delivers on flavor over other zucchini. While to trailing, this is a large-leafed plant and will get to about four feet tall, so give it a little extra room than regular zucchini. Rated 1 out of 5 by RyanW from Did not like this squash I grew this several years ago and was not impressed. The plant was very prolific, but the texture of the flesh was soft and mushy. The flavor wasn't very good, either. Rated 5 out of 5 by bryear from Best Zucchini By Far My wife and I simply won't plant another variety of zucchini than Gadzukes!.. When I ran out of seeds a few years ago, I thought Gadzukes were just another Italian zucchini. Wrong! The flavor was never the same and the ribbing didn't stand out like this one does. We like that the seeds stay small and the fruit stays smaller in diameter when it gets older They just get longer. There is a nice, nutty flavor. We love to just dip them in eggs, coat them in flour, then fry them. It's not low-fat but BOYdo they taste great. Even our two kids just gobble them down. We've been growing them for almost 10 years and will never switch. Rated 5 out of 5 by nwgal from Great producer I tried several different varieties of Zuchs this year this was the best producer. The Italian ribbed has a slightly better flavor if you tasted them raw but Gadzukes was definitely the best producer. Mine did not have the very ribbed appearance shown in the picture in fact once picked it was hard to tell the difference between the Italian ribbed and the Gadzukes. Love this zuchinni and will be planting this next year. Rated 5 out of 5 by Yardner from Best Zuke flavor This by far my favorite zucchini for flavor. Easy to grow and even the large ones have great flavor grilled or fried. 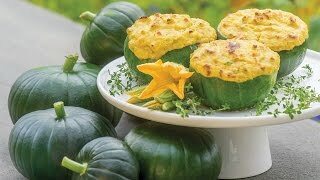 A definite must if you are a zucchini lover. Rated 3 out of 5 by CPearce from Very cool looking Zuke These were very good tasting and would grow like crazy. Unlike the standard Zuke, the skin would get tough as they would get somewhat bigger. I'd love to chop up the small ones into salads.